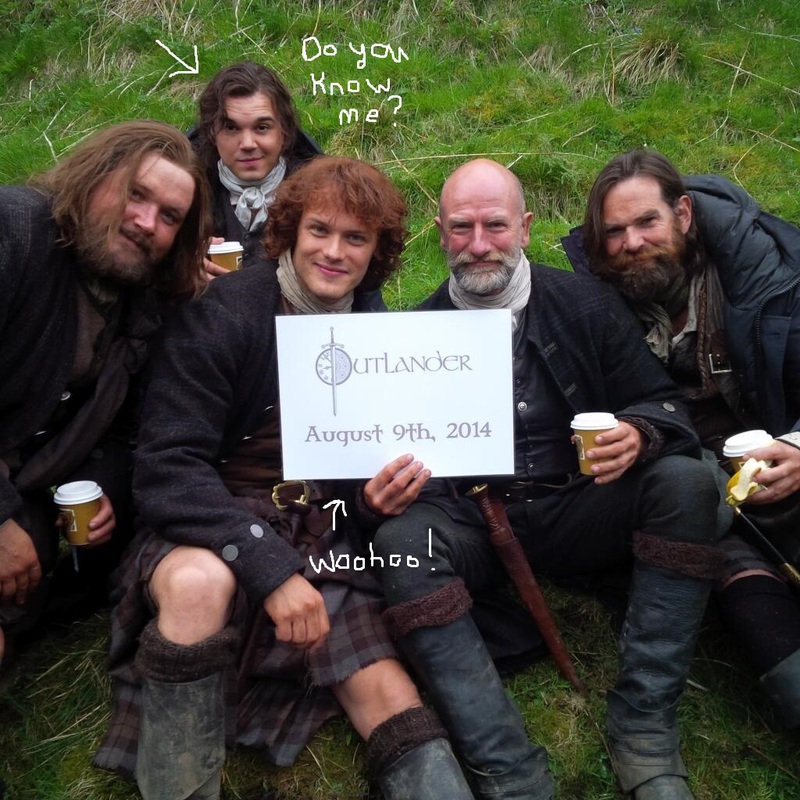 Behind the Scenes Photos of ‘Outlander’ and Who Is Willy? Secondly, here is another great photo of the cast celebrating the premiere date on Starz (via Outlander Starz on Twitter) In the photo is Grant O’Rourke (Rupert), Sam Heughan (Jamie), Graham McTavish (Dougal), Duncan Lacroix (Murtagh), and some guy in the back that I have never seen before. Diana’s Facebook Page identifies him as ‘Willy.’ I would love to present a clear and concise answer to who this person is (since this is a news website), but I haven’t a clue. There are two Williams, Willies, or Willys in the books, and I don’t think either are this person because chronologically they don’t fit. Feel free to enlighten us on the subject in the comments. I had a lovely discussion with Ginger from Outlander Podcast on the same subject and we got nowhere. Also, it would be great to know who the actor is. Again, August 9, 2014! Woohoo! Also, Sam Heughan and Caitriona Balfe shared a photo and a video respectively of their muddy walk on location yesterday. You can glimpse a little of Caitriona’s costume in the video. This entry was posted in Caitriona Balfe, Duncan Lacroix, Graham McTavish, Grant O'Rourke, Production News, Production Photos, Sam Heughan, Tobias Menzies and tagged Behind the Scenes Photos, Behind the Scenes Video, Caitriona Balfe, Duncan Lacroix, Graham McTavish, Grant O'Rourke, Sam Heughan, Tobias Menzies, Willy by Sarah Ksiazek. Bookmark the permalink.